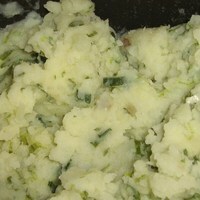 This is a traditional Northern Irish dish of mashed potatoes with milk and sliced green onions. I thought it was a delicious under our St. Patrick's Day Salmon and Leeks recipe. The leeks and green onions really went well together. That said, the green onion flavor is quite strong so I would caution against serving this with anything that might be overpowered by the onion flavor. I really enjoyed this as a side dish to the Salmon with Leeks that we served for an early St. Patrick's Day dinner. I liked the mashed potatoes and I thought they went really well when I mixed them with the stew. Thank you, John.